New Summit County Commissioner elect Elisabeth Lawrence inside the County Courthouse Friday, Feb. 1, in Breckenridge. 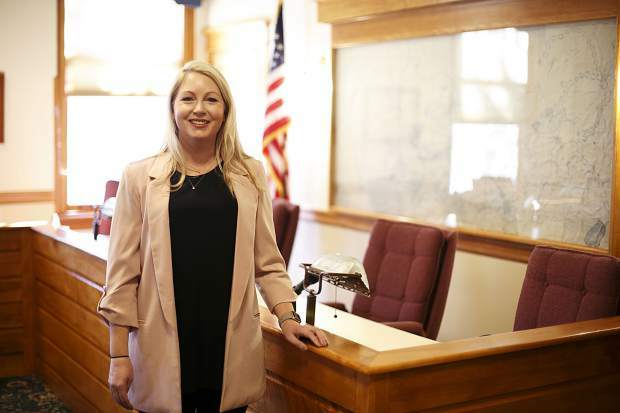 With family, friends and supporters looking on, Elisabeth Lawrence was sworn in as Summit County commissioner Friday morning at a ceremony in the Summit County Courthouse. Lawrence now joins Thomas Davidson and Karn Stiegelmeier on the Board of County Commissioners three weeks after former commissioner Dan Gibbs vacated the seat. Lawrence, a former town of Breckenridge councilwoman and mayor pro-tem, was appointed to the commissioner’s seat by fellow Democrats at a party vacancy committee meeting last week. She beat out seven other contenders, including another Breckenridge council member. While on the council, Lawrence was on the town’s Open Space and Childcare advisory committees, and oversaw the town’s early childhood care tuition assistance program and other projects. Aside from the town council, Lawrence was also director of community relations for The Summit Foundation, a philanthropic organization that gives out millions in grants to local causes every year. In the past, Lawrence served as PTA president for Upper Blue Elementary, served on the Summit County Library Board of Trustees and was president of the Carriage House Early Learning Center board of directors. Lawrence also serves on the Breckenridge Creative Arts board of directors, has been a board member of the Breckenridge Heritage Alliance and has been an active volunteer and supporter for the Breckenridge Music Festival. Hailing from Conway, Arkansas, Lawrence said she always knew public service was her calling, and she had been an ardent follower of local politics since she was a child. Her passion for politics and public service didn’t lead to becoming mayor in Conway, but she did become class president. She started volunteering for political campaigns, phone banking for candidates and eventually interning for Congressman Vic Snyder in Arkansas’ 2nd Congressional District. Lawrence studied political science at Arkansas State University before she moved to Breckenridge to raise her daughter and became active in the community. For the past 15 years, Lawrence rose to become one of the town’s most visible citizens and volunteers. Lawrence said that she believed her dedication to the community and hard work brought her where she is today, along with the support of the many people she’s met along the way. As far as why she is still so passionate about local politics and government, despite how tough and unloved the job can be, it’s a pretty simple answer: it’s in her blood. Lawrence will be taking up the reins on several key county initiatives, including wildfire mitigation, mental health, the Summit Stage bus service, as well as the county’s capital projects. She said she would take up all these matters and more with zeal, having taken up her calling to work on local issues and give back to a community that has been so generous to her.